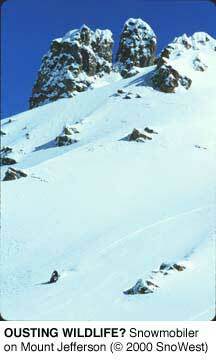 Forest Service delays decision to close Montana's Mount Jefferson to "hot-rod highmarkers"
CENTENNIAL VALLEY, Mont. - On the high slopes of Mount Jefferson, Pat McKenna, a rancher in the sparsely populated Centennial Valley, has spent 30 years watching elk, birds and other wildlife moving through the Centennial Range as the seasons change. But, increasingly, he's become worried about the region's wildlife. Due to more powerful engines and improved treads over the past 10 years, snowmobiles are able to travel deeper into the backcountry, and McKenna has been confronted with more riders in the once-silent reaches of Mount Jefferson. "Scientific studies have proven that the paths that snowmobiles create up there disturb wolverines and other wildlife," says McKenna. It's critical for wildlife, he adds, because the area is the only east-west corridor connecting the Greater Yellowstone ecosystem with Idaho's Selway-Bitterroot Wilderness. Local conservation groups such as the Montana Wilderness Association, Predator Conservation Alliance and Greater Yellowstone Coalition have joined forces with McKenna, arguing that Mount Jefferson is essential habitat for wolverines, lynx, elk and, possibly, grizzly bears. "I was a snowmobile guide for 10 years," says McKenna. "I love snowmobiles, but these hot-rod highmarkers use the place at the expense of everyone else." According to a 1991 interagency recommendation by the Bureau of Land Management, Mount Jefferson should be managed as wilderness, but the paperwork was never completed. At that time, very few snowmobiles visited the area, and closing it to snowmobiles was not a priority. Since then, snowmobile use in the area has boomed. For five years, McKenna complained to the Beaverhead-Deerlodge National Forest about the steady increase in snowmobile use in this 4,474-acre roadless area. Last winter, at McKenna's prompting, District Ranger Mark Petroni decided to revisit the management policy. In January, he sent a letter to local citizens, conservationists and snowmobilers explaining his intention to begin a process of review and public comment in order to correct that oversight and complete the paperwork to manage the area as wilderness. During the comment period, snowmobilers led the opposition. "I have special feelings, spiritual feelings about Jefferson that are not replaceable with another piece of ground," says Adena Cook of the BlueRibbon Coalition, who has been riding in the area for nearly 10 years. SnoWest magazine ranked Mount Jefferson as one of the top four spots in the country to highmark, a maneuver in which snowmobilers attempt to make the highest mark on the mountain before their machines get stuck. Also, Cook says, it's an important corridor for snowmobilers from Idaho who need to cross the Continental Divide at Mount Jefferson to reach popular bowls. "A lot of people will lose out if Mount Jefferson is closed," says Jerry Matthews, a rider from Idaho Falls. While there are no exact figures on the number of snowmobilers in the area, Matthews says it has become very popular because it is the only place near the snowmobiling mecca of Island Park that offers a challenge for advanced riders on powerful machines. Local politicians have also raised concerns about the potential wilderness ruling. Idaho Sen. Mike Crapo, R, asked for and received an extension of the initial comment period because he said the Forest Service was "steamrolling the input of snowmobilers." Montana Sen. Conrad Burns, R, requested additional public meetings, and Montana Rep. Rick Hill, R, wanted the Forest Service to begin a lengthy investigation of Mount Jefferson's resources. "Can the public be assured that conditions have remained the same ... that new information was not relevant to this decision?" asked Hill. While the District's review found that the area still retained its wilderness character, and public response favored closure by a ratio of 2-to-1, Forest Supervisor Janette Kaiser decided to follow the politicians' recommendations and conduct additional analysis. In April of 2001, Kaiser opted not to make a decision on Petroni's recommendation to ban snowmobiles until new analysis under the National Environmental Policy Act could be conducted. She estimated the process would take two years. "My goal is to get the issue laid out clearly, not to rush to a decision," says Kaiser. "I don't feel a sense of urgency." She says that "conditions have changed that could potentially affect the area." That includes the snowmobile ban in Yellowstone National Park, listing of lynx as an endangered species, and the revision of the Targhee Forest Plan in Idaho, all of which could limit sled use in the region, and make Mount Jefferson more important to snowmobilers, she says. Once the darling of environmentalists, the National Environmental Policy Act is now used by motorized recreation groups to guarantee backcountry access. "The National Environmental Policy Act was created to ensure we act slowly and carefully to avoid damage to the land and other natural values," says Jacob Smith of the Wildlands Center for Preventing Roads in Boulder, Colo. "The irony is the Forest Service is now using the Act as an excuse to let the damage done by off-road vehicles continue unabated." Land managers themselves may also be seeking shelter under the slow process of NEPA. According to Eric Wingerter, national field director for Public Employees for Environmental Responsibility, forest supervisors and other high-level land managers are trying to keep their heads down on controversial closures. "Land managers may want to make science-based decisions for the resource, but intense political pressure and the fear of losing their jobs often guides their actions," says Wingerter. As off-road vehicles continue to push deeper into wildlife habitat throughout the Rockies, many predict that Mount Jefferson may be the first in a long line of legal clashes over NEPA process. Up on Mount Jefferson, McKenna worries the debate is going to get ugly. "I hate to see it go to court," he says, "but that's where we're headed." The writer is associate editor for Hooked on the Outdoors in Boulder, Colorado. Greater Yellowstone Coalition, Tim Stevens, 406/586-1593.